the box set has now sold out but the re-release of saturation bombing 1 is available as a digital download. saturation bombing 1 was a concert series organized by T.i.K. and held in toronto, canada every second thursday of the month over a four month period from March - June 2003. each night featured 2 bands and all the bands appeared on the accompanying compilation. the cd was sold as a limited cdr release with only 100 copies sold. It quickly sold out and has been out of print ever since. now bugs crawling out of people have re-released it with new art to make it available for the first time in 5 years! the popularity of the first concert series led to T.i.K. organizing the now legendary saturation bombing 2 festival, the first major industrial concert festival held in canada. the series was held over 3 days and featured cutting edge acts from europe, the united states and canada. TiK recordings released the saturation bombing 2 compilation on cd to accompany the festival. 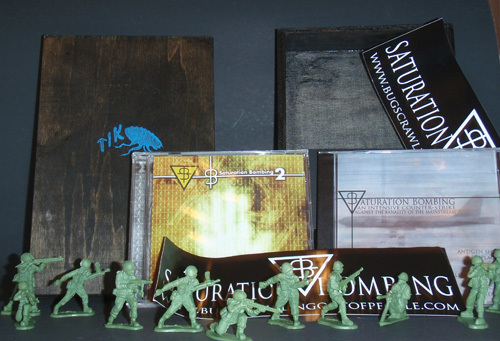 in 2008 bugs crawling out of people released the saturation bombing and saturation bombing 2 (from the now defunct TiK recordings) together in a limited edition wooden hand painted boxset! also included two large stickers, old passes from the original events, and 'action TiK troopers'.